Northern gardeners take note, there’s a new ninebark that has a lot to offer. Not only is First Editions® ‘Little Devil’ ninebark a low maintenance shrub, this little number adds color and texture to any garden space. If you love the look of ninebark, but don’t have room for the large varieties ‘Little Devil’ has it all in a compact, easy to care for ninebark. ‘Little Devil’ features deep burgundy foliage throughout the season and small white-pink clusters of flowers in June. This shrub is an excellent choice for any home garden because of its smaller size. Growing only to four-feet, just imagine the many uses, such as a great background for your flowerbed or the perfect shrub border. An exciting improvement in ninebark, ‘Little Devil’ is disease and pest resistant and requires very little maintenance. It keeps its great compact shape without pruning. Look for ‘Little Devil’, from Bailey Nurseries, at better garden centers. ‘Little Devil’ Ninebark can now be purchased online. Visit the web site http://www.FirstEditionsPlants.com to shop for your favorites. It’s difficult to go wrong when you chose native plants, trees and shrubs for your landscapes. “Native perennials and ornamental grasses are in demand like never before, and for good reasons, these species and selections have stood the test of millennia in real-world, new-world conditions,” from Emerald Coast Growers, a wholesale grower. Remember native plant selections are often drought tolerant, pest and disease resistant. • Asclepias — Milkweed is a Grade-A perennial whether you choose pink-flowering A. incarnata, or bright orange, butterfly-beloved A. tuberosa. • Baptisia — False indigo has deep roots in American history. Now an ornamental favorite, it was once prized and subsidized for the blue dye made from its sap. • Echinacea — Everyone’s favorite native! A decade of innovative breeding brings bold forms and revolutionary colors to the long-lived, much-loved coneflower. • Lewisia — Named for explorer Meriwether Lewis, bitterroot brightens border or windowsill with cheerful pastel flowers and semi-succulent foliage. Penstemon — A brazen flourish and a colorful fanfare of trumpets on sturdy upright stems. Extremely tolerant of extreme weather. Phlox — Everyone’s other favorite native. Choose from 11 varieties of tall, stately P. paniculata, 14 of low, mad-blooming P. subulata, or 2 midsized P. divaricata. According to a recent release from Emerald Coast Growers, “native perennials and ornamental grasses are in demand like never before, and for good reasons. 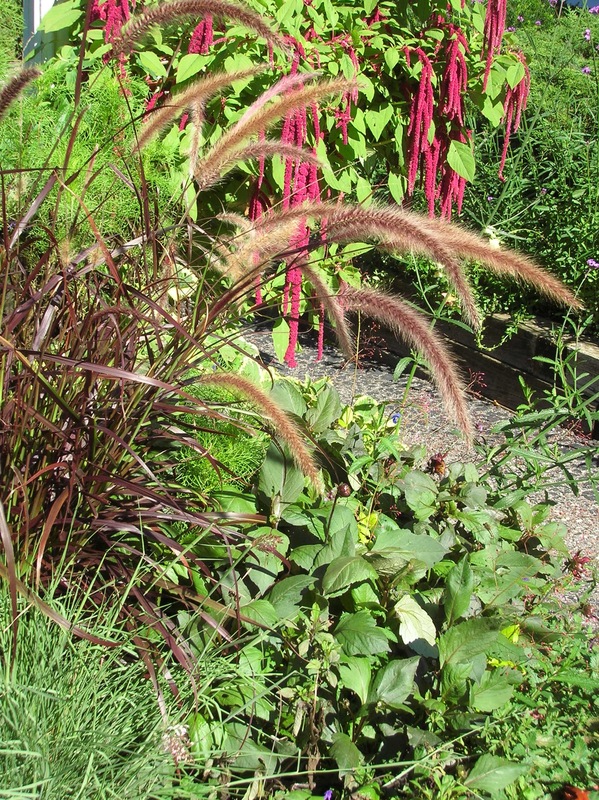 Ornamental grasses add movement and texture to any landscape in a format that often changes with the seasons, some even presenting winter interest as well in a way no other plant can. Natives are also often resistant to diseases and drought. Andropogon — Big bluestem makes a big statement. It’s the go-to grass for reclaiming and beautifying damaged lands. Deschampsia — Hairgrass: The straight species D. cespitosa, or ‘Pixie Fountains’ at half the height. Muhlenbergia — Named for a Pennsylvania botanist, Muhly grass sprays a fine mist of plumes, pink or white, over slender green foliage. Schizachyrium — Little bluestem, once part of Andropogon, is now a stand-alone genus. Choose from seven tough, colorful varieties. Sorghastrum — Indian grass brings the spirit of the prairie home. Metallic blue foliage and reddish-brown plumes with yellow anthers. 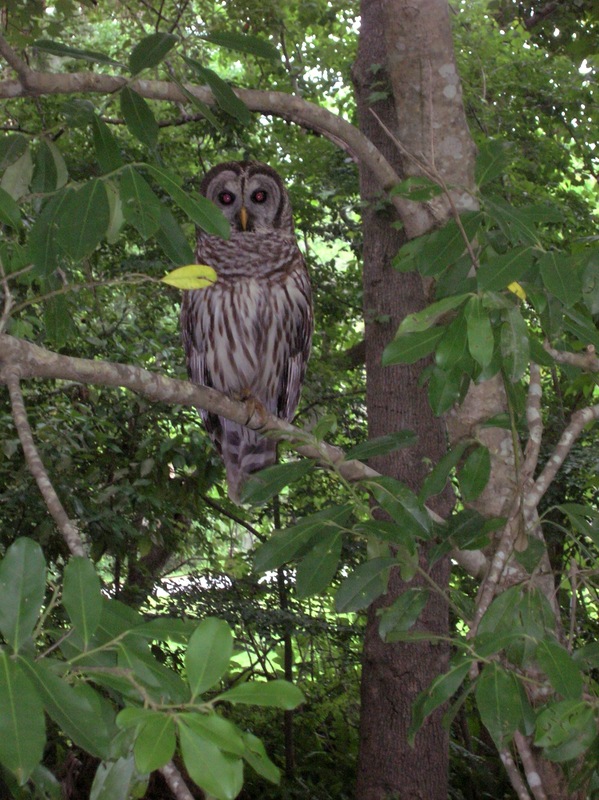 Today as I was walking down our long driveway to get the mail, I passed right by a beautiful barred owl. Luckily I had my camera with me, ready to snap a photo of anything that I might encounter. Actually I was expecting to see a snake, which I suspect that owl was also looking for. No snakes today, so I snapped a couple shots of the driveway which is lush with native trees and plants. Inadvertently I captured that owl in one of those shots, and if you look closely at the photo you’ll see it on a branch down low on the left side of the drive. I had not spotted it yet. It wasn’t until I was on my way back up the drive that I saw the owl, down low on a branch. I’m not sure who was more surprised — me or the owl. I slowly approached it with the camera turned ON and the zoom extended. My subject submitted to a couple photographs before it silently flew away to a large live oak nearby. No snakes for it either today, at least not from my driveway. It isn’t unusual to see a snake or a rabbit as I walk to the mailbox, but the presence of all the wildlife is no coincidence. We have provided habitat that attracts all manner of animals, trees, shrubs and plants that provide cover and a variety of food sources. It is a low area that also contains a stream-like drainage ditch that adds an element of water too. Yes, there are snakes. But that also means those snakes, lizards, song birds and rabbits too attract predators like hawks or that owl. Not only have we allowed a small portion of the property to grow up into a natural little forest, we have also “installed” a brush pile. It serves more than one purpose. It is a handy spot to discard downed limbs and shrub trimmings, and it also provides habitat and hiding places for a variety of animals. And there’s one more thing the natural area has provided for us — as if the wild menagerie wasn’t enough! — we no longer have to mow that area. Our little “forest” has not only enriched our lives, but that of a variety of wildlife as well. Welcome nature into your landscape and you’re liable to be surprised at what you might see too. 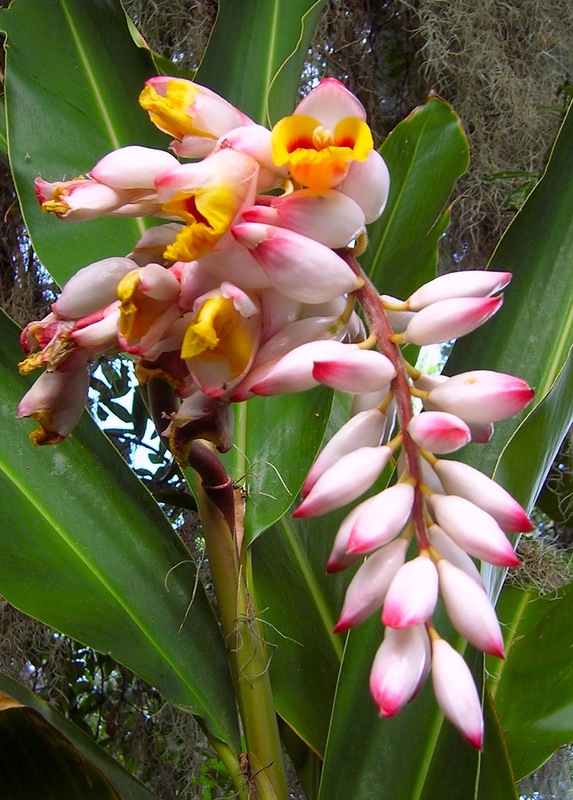 The shell ginger (Alpinia zerumbet) came into bloom in mid-April. This fairly cold-hardy tropical ginger takes a lot of room, but delivers stalk after stalk of striking shell-like blooms. Unlike, butterfly ginger (Hedychium coronarium) which is delightfully fragrant, shell ginger has no aroma. For most of the tropical gingers (of which there are many) plant in a moist location with dappled sun and an acid soil well-amended with compost. Give these gingers plenty of room to spread and enjoy the show. Though many will die back in North Florida during especially cold winters. they usually come back in the late spring. Recently I’ve added a number of peacock gingers (Kaempferia laotica) to the shady riverside bed and lo and behold, spotted the first flower this morning. Peacock ginger is often considered a ground cover plant and is the Deep South gardener’s answer to hosta. While the blooms of these low-growing gingers are indeed sweet, it is the foliage that attracts most to this colorful choice, many varieties of which have variegated leaves. Peacock ginger usually dies down during the winter months, slowly reappearing in the spring, with the flowers sprouting up first. The two varieties I am working with are ‘Bronze’ small-leaved and a “Giant’ peacock ginger (common names). 2. Into the soil you’ve removed, mix in 10 pounds of compost and a couple handfuls of Bulbtone. 3. Return most of the amended soil to the planting hole, and make a hole in this to accommodate the root ball of the clematis. Fill the hole with water and let it drain. Place plant in the hole so that the soil line will be about two to three inches above that of the soil line of the pot. Fill in with the amended soil. 4. Water plant in well, the clematis will need at least an inch of water per week, either from rainfall or irrigation. Visited a pottery importer near Apopka, FL recently. The variety and sheer size of the pots was impressive. How could anyone choose just one? Adding a colorful or sculptural pot, especially a substantial one, adds instant interest and contrast in the garden — even if there is nothing planted in it!